When it comes to big expenses, most of us parents are giving our teens too much credit and too little credit, all at the same time. How so? On the one hand, we’re giving our teens too much credit (in the form of dollars) by covering big ticket items for them — often when we can’t even afford them ourselves. On the other hand, we’re giving our teens too little credit (in terms of respect for their capabilities) by assuming they can’t handle paying for at least a portion of these major expenses on their own. Emergencies. Like adult life, teen life is punctuated with unplanned financial “emergencies” — a broken iPhone here, overage charges on the family data plan there, that first parking or speeding ticket, and so on. To date, I’ve always dealt with those financial emergencies by extending short term loans to my offending teenagers and aggressively “garnishing” their wages until paid back. While that instills accountability (good), it also encourages relying on credit to cover emergencies (bad). There’s a better way that I hadn’t considered until reading Rachel and Dave’s book: insist that your teen save up for an emergency fund of a couple hundred dollars (they recommend $500 by the end of high school). I think that’s a brilliant idea: an accountability message and a debt-free message all wrapped up in one nice package. A Car. I’ve always shared Dave’s “buy used, buy with cash” car mantra. As Dave says: a “new car smells...like depreciation.” So true! 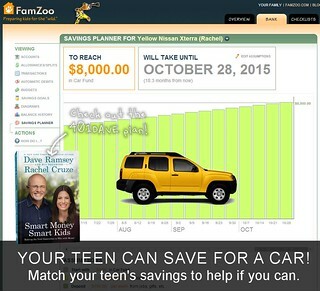 When my daughter naively declared that she wanted a new Jetta for her first car, I had her plug the figures into the FamZoo savings planner to see just how many decades of allowance that would take. That was an immediate epiphany! Daughter: “Uh, nevermind.” Dad: “How about a used Honda?” Indeed. What I hadn’t considered was the “401DAVE Plan” in which the teen saves up for a used car and the parent matches the teen’s savings dollar for dollar. I love those kinds of matching arrangements between parent and child. Mutual skin in the game is always good. Dave describes how each of his three children bought cars this way: used car + cash up front + parent matching. Share these excellent stories with your young teens to set expectations early — ideally before they start lobbying for a car. College. Who’s job is it to save for college? The parent’s, right? Not so fast — especially if it comes at the expense of parents saving properly for their own retirement. The college chapter in Smart Money, Smart Kids (which is subtitled “Don’t Graduate from I.O.U.”) really changed my default thinking on this topic, particularly in light of the fact that student loan debt now outweighs credit card debt in this country. If you are struggling to save for your kid’s education (or even if you aren’t), you need to read this chapter. Dave and Rachel prescribe excellent college savings strategies for the full spectrum of financial situations. As with the 401DAVE car plan, I particularly like the hybrid approach with the child contributing through part-time and summer earnings. Retirement. This one isn’t explicitly mentioned in the book. A teen saving for retirement might seem like the craziest of these four suggestions, but it might just be the smartest. Teen’s have one huge thing on their side when it comes to investing: time. For any teen who makes some W-2 income from a summer or part-time job, there’s a perfect opportunity to leverage a terrific tax-advantaged investment engine: the Roth IRA. Mix in some parent matching and you have one terrific arrangement: the “Family 401k”. It’s my all-time favorite family finance tip. Check out the details in this post for more details. So, when it comes to your teen’s big expenses, dial back the financial credit, dial up the responsibility credit, and match them in the middle. Love your summary:) I've read through the book and likewise, learned a lot from his "new" perspective. What was liberating is that he gives permission for parents to not feel obligated to pay for children's college. One observation I have though, is, in "his & Rachel's" situation, based on their experience, they've made this all work. I have to agree that their strong spirituality, faith and belief system, likely their strong support system, have all worked for them. They stress the importance of community at the very end of the book though very brief. How to find that community, is one big challenge, and something I still feel like I'm working through. In a way, famzoo is one for me. So thanks so much for sharing information and thoughts. I appreciate your service very much as well. M.I., that's a perfect word for the college chapter - "liberating" - and a very important point about finding support through values+community. I hope your supportive community continues to come together for you. I'm absolutely delighted if FamZoo can be even a tiny positive piece of that support system. Thank you for sharing that highest form of compliment. It's the kind of gem that keeps us pounding away at our mission (going on our 8th year!) Best wishes to you and your family. I agree that Smart Money Smart Kids is a great book and the points you highlighted are right on target. My 3 teenagers know up front how much college money they got from my mom when she passed away and how much my wife and I have saved for them in a 529. And they know that whatever else they spend is their responsibility. I helped my daughter crunch the numbers to see where she'd end up financially at graduation if she chose the private college vs. the in-state public university she was considering. It was a couple hundred thousand dollars swing in her projected net worth. At graduation, she'll end up with money left in savings instead of a huge student loan. After reading about the HUGE impact due to compounding interest of starting retirement savings early, I set up a program with my kids to match their first $2500 in an IRA by the time they are 25 years old. So now my oldest (19) just got an IRA set up at Vanguard. She's on her way! I love making my kids aware and responsible and then helping them out with some matching incentives. That's awesome what you've done with your teens, Mac. Kudos and thank you for sharing your best practices. It's definitely very helpful to sit down with your teen and work through a very simple projection spreadsheet. Until I showed them the projection on their Roth IRAs and how much it could grow over 50 years, they didn't take that much notice. Now we review their net worth and Roth projections every quarter. Every quarter, the concepts sink in a little more and they become more engaged. Repetition is key.